Taken from the grade book of a teacher who is proud of his pupils for working every last second until the bell rings, here is the Pittsburgh Steelers Report Card for the win over the Jaguars at TIAA Bank Field in Jacksonville. Sean Davis continues to keep the lid of opposing offenses and limited a Leonard Fournette to simply reaching the second level as opposed to exploiting it. Coty Sensabaugh had another strong game with 7 tackles. Terrell Edmunds also quietly had a good day as did Joe Haden. Blake Bortles was 10 of 18 for 104 yards and Jacksonville lost -3 yards on its last 5 possessions, when all it needed was a first down. 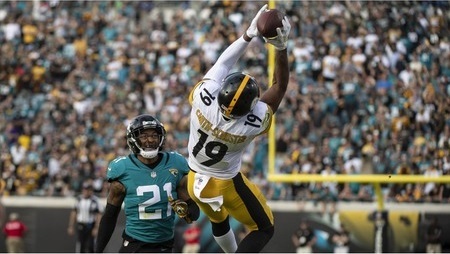 Grade: A.
Randy Fichtner went up against one of the NFL’s best defenses, and while the Jaguars clearly tested the Steelers, Fichtner’s offense came up with 3 touchdowns in 16 minutes. Beyond that, the early struggles appeared to be more tied to issues of execution rather than game planning. Keith Butler‘s defense deserves any and all accolades that come its way following this game. Yes, it is true that the Jaguars appeared to be in the process of imposing their will on the Steelers defense in the first half. But instead of demoralizing the Steelers defense, it energized them, and the Steelers defense went into complete shutdown mode for the game’s final 20 minutes. To be sure, the Steelers weren’t shutting down the Greatest Show on Turf or the Jimmy Johnson’s Dallas Cowboys of ‘90’s, or the New Orleans Saints of 2018, but limiting any offense in this day and age to negative yards for a quarter and a half when the only thing the offense needs for victory is a handful of third downs is impressive. Early in the 2nd half, instead of declining a penalty that would have brought up 4th 1, Tomlin accepted it and his defense responded with a strip sack that forced the Jaguars to punt from their end zone. Later, Mike Tomlin managed his timeouts so that his offense had one to for the final drive. After the game Mike Tomlin swore that the Steelers hadn’t made any adjustments. Yet the educated eye could see that the Steelers had made one key change. Daniel McCullers’ Number 93 was not often seen in the second half. 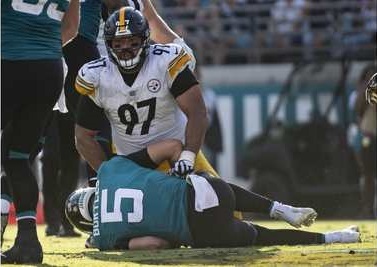 Instead, it was replaced by Javon Hargrave’s number 79, who in addition to helping completely shutdown the run, also managed two sacks, two more quarterback hits and defensed a pass and for that Javon Hargrave wins the Unsung Hero Award for the Steelers win over the Jaguars. This entry was posted in Steelers 2018 Season, Steelers Report Card, Uncategorized and tagged Antonio Brown, Ben Roethlisberger, Bud Dupree, Cameron Heyward, Chris Boswell, Coty Sensabaugh, Daniel McCullers, James Conner, James Washington, Javon Hargrave, Joe Haden, Jon Bostic, Jordan Berry, Jordan Dangerfield, JuJu Smith-Schuster, Keith Butler, L.J. Fort, Le'Veon Bell, Mike Tomlin, Pittsburgh Steelers, Randy Fichtner, Ryan Switzer, Sean Davis, Steelers vs. Jaguars, T.J. Watt, Terrell Edmunds, Tyson Alualu, Vance McDonald, Vince Williams, Xavier Grimble. Bookmark the permalink.